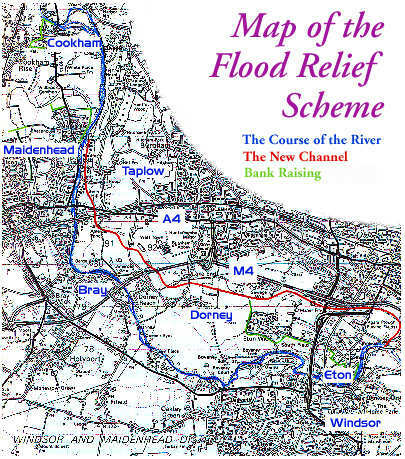 The Flood Relief Scheme, now known as the Jubilee River, from upstream of Maidenhead to downstream of Windsor was a major undertaking. The original costings were some £84 million. The new channel extends for 11 kilometres, almost 7 miles, and is now completed and christened 'The Jubilee River'. HRH The Duke of York performed the Opening Ceremony on Thursday July 11th 2002 at 9.30am. We are grateful to the Environment Agency Project Office at Maidenhead for their help in preparing this information. The towns of Maidenhead, Windsor and Eton and nearby villages have a very long history of flooding from the river Thames. The threat still exists. Flooding will occur again and again in this area unless some scheme of alleviation is implemented. This area floods about once in five to seven years and there was a flood of this magnitude in 1990, which affected around 500 homes. The last major flood occurred in 1947 and had a return period of 1 in 56 years. If a flood of this size were to happen today it is estimated that over 5,500 properties (and consequently over 12,500 people) would be affected at a cost of £40 million. The major roads in this area, including the M4, would be closed and electricity, telephone and other services would be interrupted. This would affect countless other people and would have an adverse effect on the local economy. Which in turn would affect the national economy. After the 1947 flood, there was a lot of public pressure on the relevant authorities to do something to stop a similar flood happening. The Thames Conservancy was the relevant authority at that time, and they investigated the problem and produced a summary report. The Chief Engineer of the Conservancy recommended to the Board that planned zones should be established along the length of the river in which new development should be prohibited and existing development be demolished when it came for sale. appropriate action by amending their County Plans. In December 1954 Maidenhead flooded again. This time it was as a result of the Maidenhead Ditch overflowing and not the river Thames. The Conservancy decided to undertake flood alleviation works in this area by increasing the capacity of both the Maidenhead Ditch and The Cut. They also reconstructed a bridge north of the Maidenhead Ditch so that when the flow in the Maidenhead Ditch reached its capacity, the bridge would restrict any more incoming flows and store excess water in a pond area in North Town Moor. These works which have a capacity for a one in ten year return period flood were intended to stop a repeat of the 1954 flood only, and were not undertaken to solve the overall flooding problem in Maidenhead. undertake surveys in respect of flooding and land drainage. From these surveys, the Maidenhead flooding problems were identified and strategies developed for possible solutions. There are flooding problems along the whole length of the river Thames, but it was considered impossible to solve the problems along the whole length in one go. The Maidenhead area was identified as needing priority action because of its history of repeated flooding and where money spent would produce the greatest return in damage avoided. Thames Water Authority appointed a specialist firm of consultants to investigate the flooding problem and also what would be the likely benefits of various options of flood alleviation schemes. They identified that there would be considerable benefits if the flood damage could be avoided and that it would be possible to alleviate flooding in this area. Following this report, consultants working on behalf of Thames Water Authority undertook exhaustive studies of the complex and interrelated engineering and environmental considerations of various flood alleviation schemes. Local authorities and other interested organisations and individuals were consulted extensively and their responses were taken into account. All possible options were considered so that the scheme chosen was the most appropriate method of meeting flood alleviation in this area. In January 1989, the Thames Regional Land Drainage Committee agreed to seek planning permission for the Scheme chosen and in March 1989 they agreed To extend the Scheme to provide flood protection for Windsor and Eton, and not just Maidenhead. The National Rivers Authority took over the work of Thames Water Authority when it was formed in September 1989 and continued to investigate and develop the Scheme. The present Project Team was appointed in September 1989 with a brief to obtain planning permission by negotiation, if possible. Unfortunately it was not possible and a local Public Inquiry was set up in 1992. The Environment Agency is the statutory successor to the National River Authority, Waste Regulation Authorities and Her Majesty's Inspectorate pollution. The Agency has inherited all flood defence duties from the National Rivers Authority and this includes constriction of the Maidenhead, Windsor and Eton Flood Alleviation Scheme. 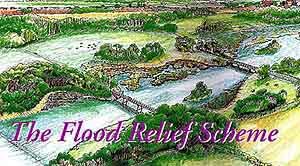 All methods of flood relief were considered including storage, dredging and embankments before it was decided that the best option was to construct a Flood Relief Channel. Over 492 possible combinations of routes were examined and evaluated, and local authorities and other interested organisations and individuals were consulted, and eventually the present route and design were adopted. The channel solution was selected on the basis of providing a minimum protection for the area of I in 65 years flood event standard. At this level of protection the other possible options of flood alleviation were not practicable for various reasons: flood storage schemes would have needed an area the size of Oxfordshire to accommodate all the water; large flood levees along the edge of the river would not have been possible environmentally; dredging would have been disruptive and would have to be done continuously to maintain the required capacity. The Scheme takes the form of a flood relief channel, some localised bank raising close to the river and improvements to the existing flood relief channel, through Maidenhead, The Maidenhead Ditch. The channel runs along the east side of the river Thames, leaving the river at Boulter's Weir in North Maidenhead and rejoining at Black Potts Viaduct just downstream of Windsor, It has a trapezoidal cross-section that is unlined with a bottom width of about 30 m. The side slopes are 1 in 1.5 and average depth is 5 m so that for most of the route the channel is 45 m wide. The channel has been designed to look and function as a natural living river, containing water all year round, and will be landscaped sensitively to enhance the environment and create new habitats in what is currently a relatively ecologically uninteresting area. The Environment Agency will also recreate habitats that have been lost from the river Thames over the years, as a result of river-side developments. As a consequence of the high emphasis placed on environmental design, the Scheme has gained support from both national and local environmental groups. The river Thames in this area can accommodate a flow of about 285 m3/s. Above this level the excess water will overflow the banks and fill the flood plain. The channel takes the excess water flow from the river Thames. The amount of water allowed down the channel will be controlled by radial gates near Taplow Mill. The channel and the river Thames together will be able to accommodate a flow of about 515m3/s with the Flood Relief Channel carrying 215m3/s. This will protect the area from floods with a return period of I in 65 year period, a greater intensity than the 1947 flood. It will also substantially reduce the impact of greater events. The channel will have running water all year round. The water will be supplied naturally from the ground water table and a small flow of about 10 m3/s taken directly from the river Thames. Water levels within the channel will be regulated by control structures and these will be set at a level to ensure that existing ground water levels are maintained within the area. Because of the regional significance of the Scheme, and the inability of one of the local councils to resolve the matter, the planning application was called for Public Inquiry in 1992. The Inquiry opened on 1 October 1992 and closed at the end of December 1992. Even so it was not until March 1995 that approval was finally given. "My overall conclusion is that the Scheme described in the Planning Application is a good technical solution to the flooding problem which no other option can match". "Furthermore, I find that the evidence strongly suggests that the Scheme would be a uniquely attractive addition to the landscape between Maidenhead and Windsor. Whilst the finished Channel will be a quiet and pleasant addition to the local scene, its construction will cause considerable local disturbance for a limited period of time. The major challenge will be the removal of excavated material, principally minerals, from the site. The majority of this material will be taken directly along the line of the channel to a processing plant and then on to the M4 Motorway via Junction 6; material from the two end sections will be removed by barges on the Thames. This will avoid any use of local roads for other than construction traffic to specific sites. Since the granting of the Planning Approval the minerals industry has been working hard to find ways of accommodating 3.5 million tonnes of mineral from Maidenhead in 31/2 years whilst at the same time Eton College are producing 4.5 million tonnes over a period of 11 years into a contracted market which is already fully supplied. Many of the solutions allow for long term storage of material and various potential contractors have obtained planning permission on various sites for importation and storage. There is planning permission to install a rail siding on the site of the gravel processing plant and permission for a conveyor to bring mineral from Area Nine to the rail terminal. This option is strongly favoured on environmental grounds and carries the possibility of receiving a Government Grant to enable the environmental benefits to be realised in the face of possibly adverse financial factors. Sale of the minerals will go some way to offset the cost of constructing the channel although the Treasury have insisted it is not an economic gain and all reference to the sale of minerals has been omitted from the benefit/cost assessment approved by them. The estimated gross implementation cost of the Scheme is £83.5M including a projection of inflation at 3% to the end of the construction period. This sum will be offset by money arising from the sale of minerals. The Scheme is designed to alleviate flooding of some 4,800 private properties, benefiting some 12,500 people, 700 commercial premises and major infrastructure - for example the M4 - that would be at risk. The tangible benefits arising from the Scheme, discounted at 6% to 1992, are £52.728 million. The implementation and maintenance costs of the Scheme over its designed life of 65 years, again discounted to 1992, are £43.738 million. This very robust figure has been accepted by the Ministry of Agriculture, Fisheries and Food but the inclusion of recreation and amenity benefits and benefits from the sale o minerals has been disputed by the Treasury. Nonetheless, even with these excluded the ration is 1.07:1 which is just about satisfactory. The map above shows the route of the Flood Relief Channel and associated works. Brief descriptions of points of interest are included below. A more detailed location map, including parking, is available on the Environment Agency website where there is more information. The flood relief channel will leave the Thames on the line of the existing Taplow Mill Leat. The intake structure to the Flood Alleviation Channel will be located at the bottom end of the Leat. Flows into the Channel will be controlled by three radial gates with subsidiary tilting gates built into the top to provide summer flows. There is a total of six control structures along the route of the channel; three fixed and three moving. The Channel will cross under the A4 through a bridge built with a full scale diversion of this busy road. It will then pass through a vacant plot and under a bridge to be constructed through the railway embankment from the south side. Because of the restricted working area, the Channel will narrow to 25 metres in this reach. 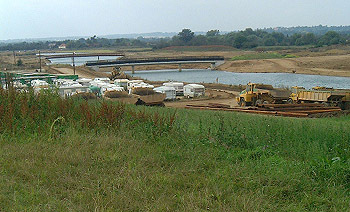 The construction site for the crossing under the railway is located to the south with access from the A4 and the south side of Amerden Lake. The crossing will be by means of a jacked structure with rail traffic kept moving at all times. The jacking is planned to take four weeks of continuous working. Work on the channel and associated works to this point started in August 1998 and will continue to the winter of 2000. Preliminary tree felling has been undertaken along the line of the Channel and road diversion on the A4. The timing of this and the preliminary investigations were very critical. The site was surveyed by a wild life expert who located badger runs and setts and bat roosts. No setts were affected but some diversion of badger runs was necessary. Various bat roosts were identified. The tree felling was undertaken within a very narrow line window set between the end of bat hibernation and the start of bird nesting during March 1997. The work was overseen by English Nature who decreed that it should be complete by 15th March. In the event a large tree was found to be dangerous and an extension was granted until the 20th March. The wild life specialist was in attendance at all times and although he found evidence of bats roosting, they had come out of hibernation by the time the work was done. Bat boxes have been provided to replace the roosts destroyed in the tree felling. Large trunks and branches were removed and sold for logs, smaller arisings were burnt on site under carefully controlled conditions. Work is currently underway on the rail crossing to stabilise the embankment and underlying soil using freezing equipment. The construction of the bridge structure has begun and this will be jacked through the embankment in April '99. The contract is due for completion in June 1999. The route of the Channel crosses Marsh Lane through a bridge constructed by means of a full scale road diversion. The second moving control structure is incorporated in this bridge. This consists of two 1Om wide flap gates, which lower gradually to the base of the Channel as the flow increases. Mineral traffic will cross the lane at grade. A bridge crossing the Channel has been built by means. of a full six lane diversion of the Motorway. Once the diversion was in place the bridge was of conventional construction. Work started on February 9th 1998 and will take approximately 12 months. This is a similar crossing to Marsh Lane but there is no control structure. To the east of Lake End Road is the first section of the Flood Relief Channel to be excavated. This is to the final width, shape and depth with only the edge shaping for the landscaping outstanding. This stretch of channel was the source of all the materials required to construct the waste containment cell described in 6. To the west of Lake End Road is a large archaeological dig covering about 5ha with a large number of minor finds. Thames Water Utilities, and before them Slough Borough Council, have used this area for the tipping and subsequent reclamation of sewage sludge. This appears to have started before the enactment of Trade Waste Legislation Act in 1937 and has resulted in there being substantial quantities of toxic material in the land, including List I and 11 substances (e.g. lead, copper and cadmium). A secure containment cell has been constructed with a clay and membrane lining and cover and all the polluted material moved into it. The waste containment cell covers almost 14 acres. The requirements for the clay liner were very stringent; a permeability not exceeding 1 x 10-9m/sec was required. In the event all the test results gave better than 1 x 10-11m/sec. The construction of the cell will be followed by major landscaping works and environmental enhancements. The crossing under the A355 is being constructed with split carriageway diversions. The bridge comprises two box culverts each 10m wide by 5m high separated by a 3m gap. It has been built in two halves - the northern carriageway of the A355, Windsor Relief Road, was diverted to the west and the southern carriageway was diverted onto the northern. This has enabled the construction of the eastern half of the bridge. Once complete the traffic was diverted the opposite way to enable the western half to be built. Early in the contract three 1.8m diameter pipes were jacked under the A355 to permit the diversion of Chalvey Brook. This was undertaken as the Brook is prone to pollution from the Slough Trading Estate. The original route of the channel brought it close to the brook, so to avoid the threat of contamination to the new channel it has been diverted to the north. The original culvert that carried the Brook is being converted to a footpath/cycleway underpass. During the construction period, the new bridge will provide the access to the proposed gravel processing plant. Site traffic will use the southern arch and road vehicles the northern arch to reach the M4 by means of traffic light control on Junction 6. On completion, of course, it will carry the Flood Relief Channel beneath the A355. Completion is due in September 1998. The plant will occupy the area of land bounded by the M4, the Windsor Relief Road and the Slough to Windsor railway line; some 20ha. It will operate 16 hours a day for five days and 12 hours on Saturday. It will process 1,000,000 tonnes of sand and gravel per annum. Alternatively, this could be a site for a transfer station to take materials out by road/rail unprocessed. This railway has been crossed with a jacked structure, during a successful 54-hour track possession between 3rd to 6th April. In this time the railway embankment was removed, the bridge slid into place and the rail track laid over the top. Work was completed in June 1998. The Flood Relief Channel crosses some statutory allotments, which can only be removed after an acceptable alternative has been provided. Slough Borough Council made an alternative site available and some 85 allotments were laid out. This was done in accordance with Slough's "Model Allotment" design. Fill material to raise the level of the site and sub-soil and topsoil were provided from land adjacent to the existing allotments. The new allotments were handed over in March 1997. The channel passes under the Slough Road with a full diversion and programming has ensured the A355 will be completed before this diversion is put in place. The tenders for the diversion were returned on May 11th and are currently being assessed. The 3rd moving control structure is incorporated in this bridge. This comprises two flap gates as at Marsh Lane. The Eton College playing fields, (not the Playing Fields of Eton) are located in Agars Plough. The Myrke is the name of a stream and an area of housing. Particular attention will be paid to the environmental treatment to be applied to this unique area. Semi-mature trees will be planted to reinforce the existing tree screen, part of which will have to be removed and an area of extensive mounding will be created between the playing fields and the motorway. This will act as noise protection and will avoid the need to move large quantities of spoil along local roads. Tree clearance work has been completed this spring around the Myrke area to a specific time schedule, in order to avoid hibernating bats and nesting birds. The channel passes under Pococks Lane with a road diversion. A change in the alignment of the channel to avoid a valuable archaeological site and accommodate Eton's athletics facilities has resulted in the need to demolish and relocate the beagle kennels. These are the only buildings to be demolished on the scheme. The channel utilises nine out of thirteen flood arches, the remainder being sealed off. Fixed weirs are constructed in the bottom of the arches and these form the final control structure. The small backwater is widened and deepened and the channel re-enters the River Thames downstream of Black Potts island. When the Flood Relief Channel is operational, the full level of flood alleviation will be achieved by the construction of flood banks in the Cookham and North Maidenhead area, to the west side of the river Thames. The Maidenhead Ditch was enlarged as a flood relief channel for central Maidenhead following localised flooding in the 1950s. As part of the Scheme the Environment Agency will be improving the ditch by removing constrictions in he upper reaches, which will give it a consistent capacity throughout its length of 15 m3/s.